Living in rural Pennsylvania, I've learned just how vital a dedicated meat freezer can be. Whether you're an avid hunter, buy your meat directly from a farm, or just want to stock up, you'll need a reliable place to store your goods. You don't want a rinky-dink freezer that will short out and ruin huge amounts of food in a single, catastrophic failure. Where Can I Buy a Good Meat Freezer? With the endless option of freezers on the market, it can be hard to decide which is the perfect meat freezer for you. Balancing out the sizes, features, and specs will have you switching between multiple tabs in a flurry of meaningless bullet points and numbers. Which features do you really need? And how much should you expect to pay for them? Our guide can help. Before making your purchase, there are a few questions you'll have to consider. Do I want a chest or upright freezer? The answer to this question depends on your needs. Upright freezers are highly accessible. If you think you'll be grabbing meat from it often, an upright freezer may be a good choice. The front-facing door makes it easy to select specific items from the freezer. In a chest freezer, you'd have to dig to get out items in the bottom. Upright freezers will also offer similar storage space to a chest freezer, but take up less floor space because they stand upright. Chest freezers shine in their energy savings and simplicity. Because the door opens upwards, cold air won't escape as quickly as it does from upright freezers. Chest freezers are also great for storing massive cuts of meat that might not fit within the shelves of an upright freezer. Aside from size, when it comes to freezer shopping the most prominent differences lie in the features, including defrosting method and energy savings. Some other features buyers sometimes seek include easy organization, frost-free operation, and inner lights. If the freezer isn't frost-free, it may have auto defrost, or manual defrost. If you plan on storing a significant amount of meat, manual defrosting may be a pain because once or twice a year you'll have to empty your entire meat freezer. The problem with auto defrosting is that some freezers may fluctuate their temperature a bit too much to stay defrosted. An energy efficient meat freezer is better for the environment. More importantly, it won't unnecessarily bloat your electric bill. If this sounds good to you, then look for the Energy Star rating on any meat freezer you're considering. Energy Star is a voluntary government program that helps consumers and industry to save energy and reduce emissions. An Energy Star rating on your meat freezer means that this appliance will save you money. Sears, BestBuy, and Amazon offer plenty of freezers to choose from. Brands such as GE, Frigidaire, and Maytag even let you pick out your freezer and then show you where it's available. Freezers tend to run from $150 to $1,300. The smallest freezers will be at the lower end, and the most giant and most feature-filled freezers will hit the top of the range. We first took a hard look at what respected reviewers such as consumerreports.org and Wirecutter were calling the best freezers on the market. After compiling a list of potential candidates, we narrowed our list to a range of freezers that cover a variety of sizes, brands, and features. Our focus was on providing a diverse list of the best freezers on the market so you can find your perfect meat freezer. In no particular order, we compiled a list of the ten best freezers on the market for you to convert into your meat freezer. For those who are looking to store more than an entire cow, the Whirpool WZC3122DW chest freezer will be your best bet. At 21.7 cubic feet, the storage capacity of the Whirpool WZC3122DW is incredible. The freezer requires manual defrosting and comes with a defrost drain and hose adapter to make the process easy. You get three storage baskets with your Whirpool WZC3122DW, which helps keep the beast organized. As for energy efficiency, the freezer has advanced foam insulation that keeps electric consumption down. The freezer can be a bit noisy and will take up a large amount of space due to its size. You can get the Whirpool WZC3122DW for between $700 and $950. Able to store two entire deer, the GE FCM11PHWW chest freezer provides a vast amount of storage without getting too bulky. Like the Whirpool WZC3122DW, this freezer has three storage baskets to help you keep your meat freezer organized. The freezer requires manual defrosting and comes with a drain to help accomplish the task. Unlike the Whirpool WZC3122DW, the GE FCM11PHWW comes with an ENERGY STAR certification ensuring you great energy efficiency. There's no temperature readout included with the freezer, so you'll need your own thermometer if you're looking to set a temperature accurately. Priced at between $360 and $560, the GE FCM11PHWW is at a fairly standard rate. Coming in at 16.6 cubic feet, this standing freezer makes an excellent meat freezer due to its size and ability to organize your meat. The standing freezer arrangement will let you meticulously sort and easily access your meat. The frost-free operation of the freezer will save you time and energy, unlike the previous two meat freezers mentioned. And with ArcticLock walls, your food will stay frozen for more than two days with no power. The biggest complaints on Best Buy's review page for the freezer was that it ran loud and the door can be difficult to open. 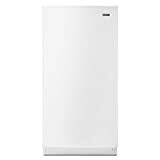 Find the Frigidaire FFFH17F2QW for between $500 and $875 - this is a pretty good deal for a frost-free upright freezer of this size. The Haier HF50CM23NW chest provides a reliable meat freezer that doesn't take up too much space. Reviewers on Amazon consistently complained about dents in their freezers caused during shipping. You can get the Haier HF50CM23NW for between $150 and $300. As an alternative standing freezer to the Frigidaire FFFH17F2QW, the Maytag MZF34X16DW provides a similar amount of storage. Like the Frigidaire FFFH17F2QW, this Maytag standup freezer runs frost-free. Also, it comes with foam insulation which will save you energy costs. The reversible door makes this freezer a strong competitor against its Frigidaire counterpart. Finally, the Maytag MZF34X16DW has a ten-year warranty for its compressor, guaranteeing a long life for the freezer. There isn't a light indicating whether the freezer is powered or not. $500 to $750 is how much the Maytag MZF34X16DW will set you back. The 21.7 cu. ft. Whirlpool chest freezer is a good pick, but sometimes you want an upright freezer instead. The upright Frigidaire FFFH20F2QW grants you a crazy amount of storage for a lower footprint and more natural organization. Unlike the Whirpool's 20-footer, the Frigidaire FFFH20F2QW runs frost-free. The frost-free feature will save you valuable time and energy down the road. As a bonus, the Energy Star certification of the Frigidaire FFFH20F2QW lets you know your meat freezer won't bloat your energy bill. Like the standup 16.6 cu. ft. Frigidaire, the door can be difficult to open due to its tight seal. You can get the Frigidaire FFFH20F2QW for around $575 - $950. 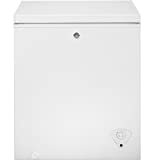 The GE FCM75KWW chest freezer provides a hefty volume of storage without taking up space larger chest freezers would. The freezer requires manual defrosting and comes with two lift out baskets. For convenience, there is a temperature adjustment knob on the outside front. There's also a power-on light to assure you your meat isn't going to waste. Though this model is currently available through various sources, GE stopped manufacturing it, so you'll need to act quickly to make it your meat freezer. The GE FCM75KWW will cost you between $200-$300. If you think the seven cubic foot GE chest freezer is a little bit too big, this model will likely fit your fancy. 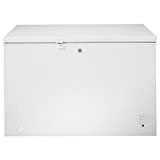 The GE FCM5SKWW is very similar to the seven cubic foot GE chest freezer. It's manually defrosted, comes with a lift out basket, and has an outer temp. adjustment knob. It also has the power-on indicator light. It's a basic freezer that doesn't have any fancy bells or whistles. The GE FCM5SKWW costs $175-$275, an affordable price if you need a meat freezer ASAP. Able to convert between freezer and fridge, the Insignia NS-UZ21XWH7 sets itself apart from the other stand up freezers in this list. You heard it right; the Insignia NS-UZ21XWH7 can switch easily between being a freezer or refrigerator. This freezer even connects to wifi to give you temperature warnings on your phone. On the front of the freezer is a panel with easy to access controls. In addition, the inside has LED lighting, and the freezer is Energy Star certified. On the downside, reviews on the Best Buy page for the freezer say the shelves will bend under heavy weight. The Insignia NS-UZ21XWH7 will set you back between $750 and $900. This Kenmore Elite standup freezer is a space-age marvel crammed with features. Similar to its competition, the freezer is frost free, so no defrosting to worry about. To lock in your meat's freshness, the Kenmore Elite has an "express chill" mode. Activating the mode brings the temperature in the freezer down to -30 degrees Fahrenheit to quickly freeze your food. Additional features include 3 LED's within and an electric control panel. The features come at a hefty price tag. At between $950 and $1300, the freezer is a pricey choice but is well worth it for all of the features included. 66.25 x 30.25 x 33.36"
50.8 x 27.5 x 33.5"
34 x 25.5 x 67.25"
22 x 28.5 x 33.2"
30.25 x 29.13 x 60.75"
32 x 32.16 x 72.36"
37.2 x 21.2 x 33.5"
32.8 x 28.9 x 76.6"
30.5 x 34 x 73.2"
For the smaller end of meat freezers, we love the GE FCM5SKWW. It gets the job done, doesn't take up too much space, and can store just about an entire deer's worth of meat. As for the large meat freezers, we're a fan of the 20.2 cu. ft. Frigidaire FFFH20F2QW. Its Energy Star certification, frost-free operation, and ability to easily access your meat make it an excellent selection. We hope we could make your task of finding the perfect meat freezer easier on you. Tell us in the comments what you plan on storing in your meat freezer. Are you a fan of farm fresh hogs or readying up for a successful hunting season? Or are you a cooking enthusiast and looking to store the best cuts you can buy? We can't wait to hear from you!